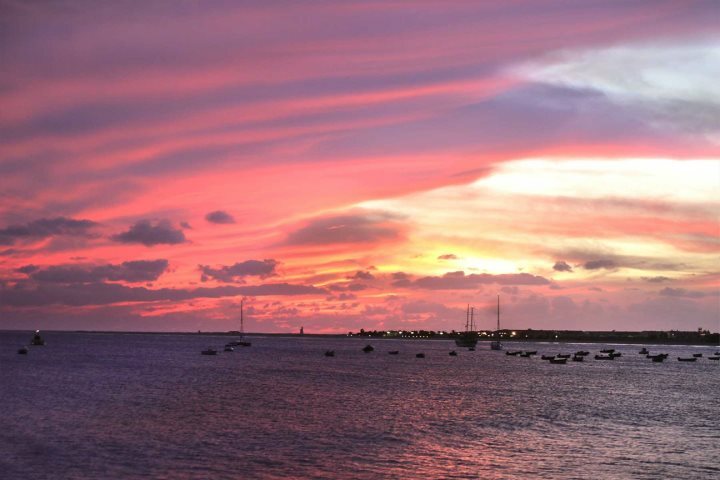 And the beaches of Santa Maria make a fabulous location for dining out by the ocean. Here are our favourites, all with a view of the beach and the glorious Santa Maria sunset. You'll find a map showing each location at the end of this post. This laid-back casual café on a beautiful sandy beach in the middle of nowhere, is known for its fabulous seafood and pizzas. It’s located about 1.5 miles from the centre of Santa Maria, on the far end of Praia de Ponta Preta, but it is well worth the walk. While the menu isn’t extensive, the food is excellent, as is the view of the ocean and the sunset. Be sure to try the chef’s Fish Curry. Ponta Preta is perfect for lunch or an early dinner, whilst watching the sun go down. 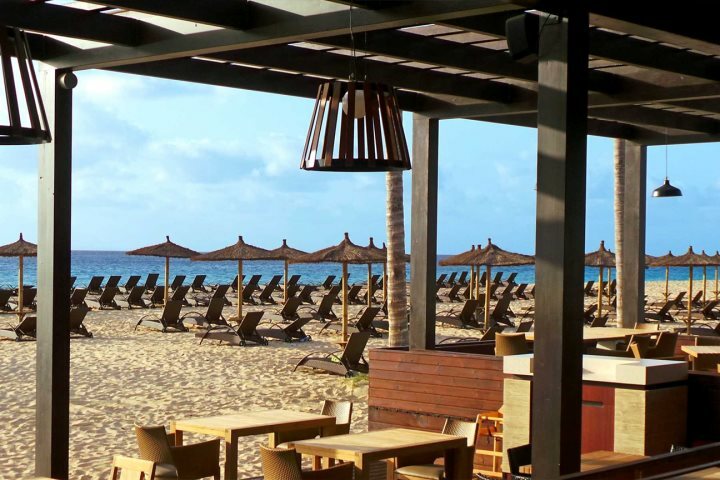 This elegant à la carte restaurant on the beach at the recently opened luxurious Hilton Cabo Verde Sal Resort offers European/Asian fusion cuisine. In the evenings, a DJ plays chill out music. It’s the perfect choice for a special occasion and is open late into the evening. 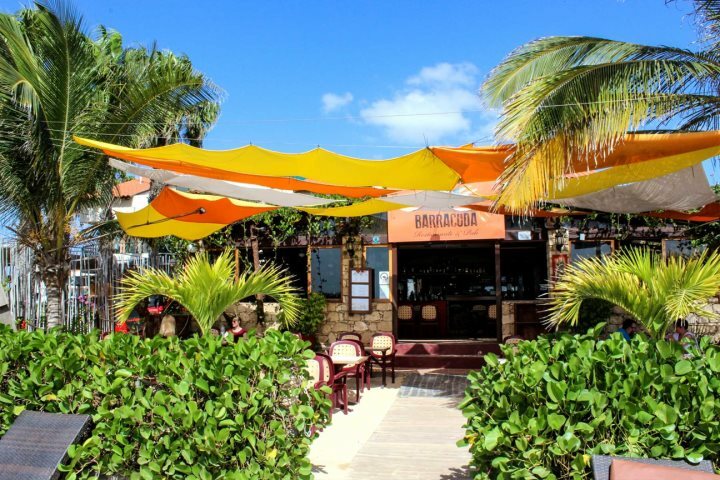 Dine with your feet in the sand at Barracuda Restaurant and Bar. Barracuda is a firm favourite with our guests. They offer an extensive menu, with the house specials including grilled ‘green’ lobster, paella, the Portuguese dish seafood ‘cataplana’ and roasted suckling pig. There is just one starter and two pasta dishes suitable for vegetarians. Mind you, their homemade goat’s cheese from the island of Fogo, gently fried and served with home-made tomato jam, is delicious. We also love their pears, which are roasted in red wine, served in their juice with a touch of cinnamon. A simple, local restaurant with a lovely oceanfront terrace and a lively atmosphere. For lunch, Angela’s offers a great inexpensive buffet, where you pay by the weight of the food on your plate. Their evening and Sunday lunchtime barbecues are also excellent, as are their fish dishes. Check out their live music at the weekends. Angela’s is popular with the locals which is always a good sign. Great value. Great food. This stylish and modern restaurant, on the beach to the east of Santa Maria, offers excellent Mediterranean and Asian cuisine. The food is beautifully presented and tastes as good as it looks. Service is friendly and helpful but can be a little slow. Best of all though is the stunning location; it’s about a mile from the centre of town, but don’t let that put you off. It’s a beautiful place to spend a lazy afternoon or to celebrate a special occasion. Inspired to take a holiday in Santa Maria? You can check out our range of hotels on the island of Sal on our website here.